Like everyone who is homeless, her story is unique. After living by the river for nearly a decade and progressing through a series of homeless service programs, Tracey is stepping forward. As she looked out the window at the river bank she once called home, Tracey couldn’t hold back the tears that slowly rolled down her cheek. It was a watershed moment in her life and the emotion was simply overwhelming. But, it was only a moment. She took a deep breath, thanked God, and sat down for her job interview at Sacramento Steps Forward. After living by the river for nearly a decade and progressing through a series of homeless service programs that saw her graduate to living on her own again, she was in good mental health, clean and sober, and ready to help others do the same. Like everyone who is homeless, her story is unique. She grew up in a loving home with two parents. Her father was a Colonel in the Air Force. As Tracey puts it, she came from money, power, and prestige. A work-related injury in 1992 led to self-medication and subsequent drug addiction. Her mental health, which had been manageable to that point, deteriorated. Her belongings were lost when she failed to pay rent on a storage unit. Her new life of injecting meth consumed her and her experience with homelessness began in 2000. She ran with a very bad crowd and called some of the most dangerous places on the river her home for eight years. Violence and crime was everywhere but thanks to those around her, she remained safe – she didn’t starve – she didn’t freeze. Her life on the river became normal. It became her community. But, after eight years on the street, she hit rock bottom. People around her were dying and she wanted to join them. She thought she was at her end. Happily, she took a different path and visited El Hogar Community Services, Inc.‘s Guest House Homeless Clinic, whose staff gained her trust over the years. With their help, she stabilized her mental health and got clean and sober. She didn’t move indoors though, not until a severely infected cat bite, which nearly killed her, hospitalized her at UC Davis Medical Center for a month. Staff from WellSpace Health took over her care at their Interim Care Program. Shared housing through Next Move Sacramento followed. 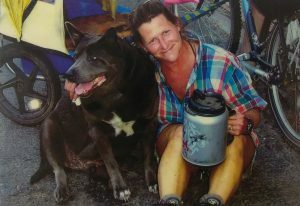 Tracey became an avid volunteer in the community and rejoiced as her health and life improved over the next two years. A tearful job interview welcomed her back into the workforce as a homeless street outreach navigator, where she spent two years working with people living the life she left behind. 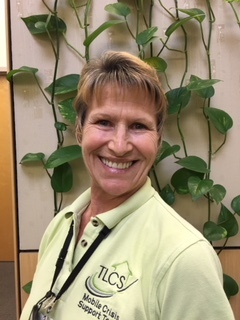 Thanks to her infectious smile and ability to build trust with those she served, she joined a newly developed Mobile Crisis Support Team (MCST) with non-profit homeless service provider TLCS, Inc..
Coming full circle, Tracey is now on the Board of Directors at Guest House Homeless Clinic. For Tracey, hope and grace spurned tragedy and despair.